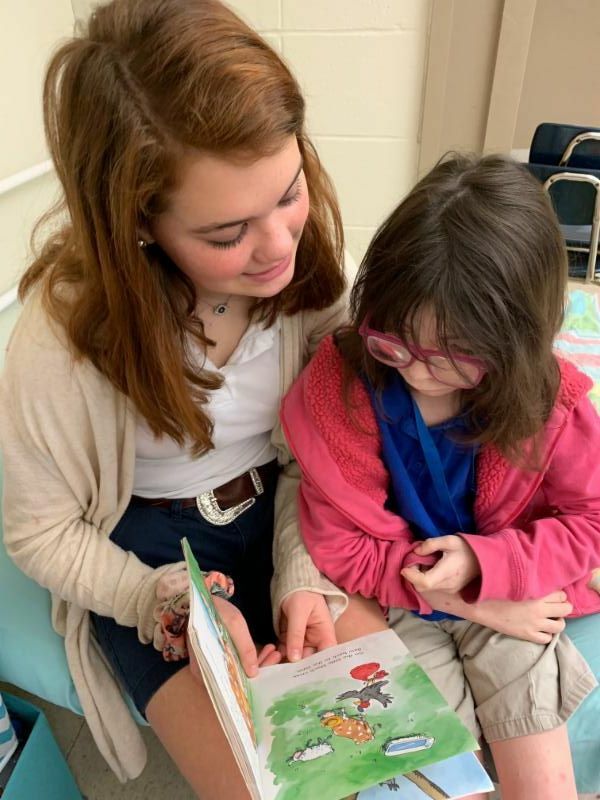 Life's most persistent and urgent question is, "what are you doing for others?" 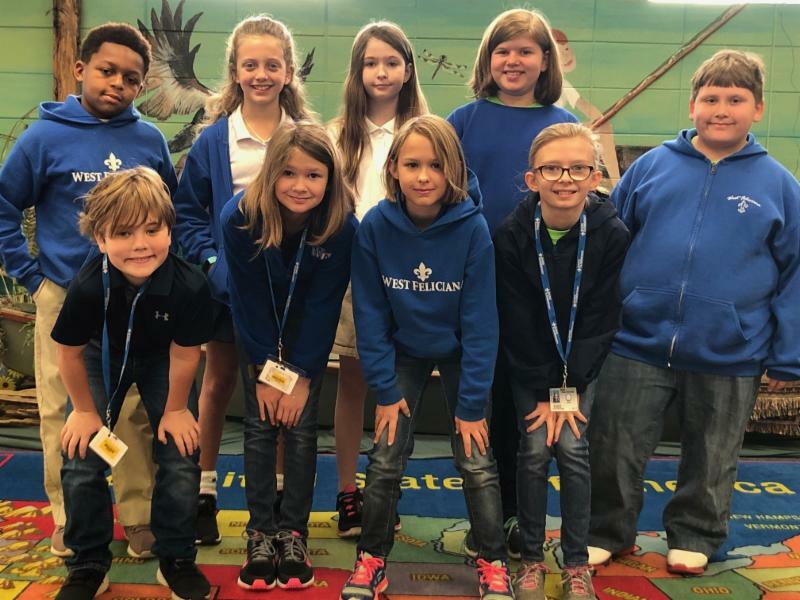 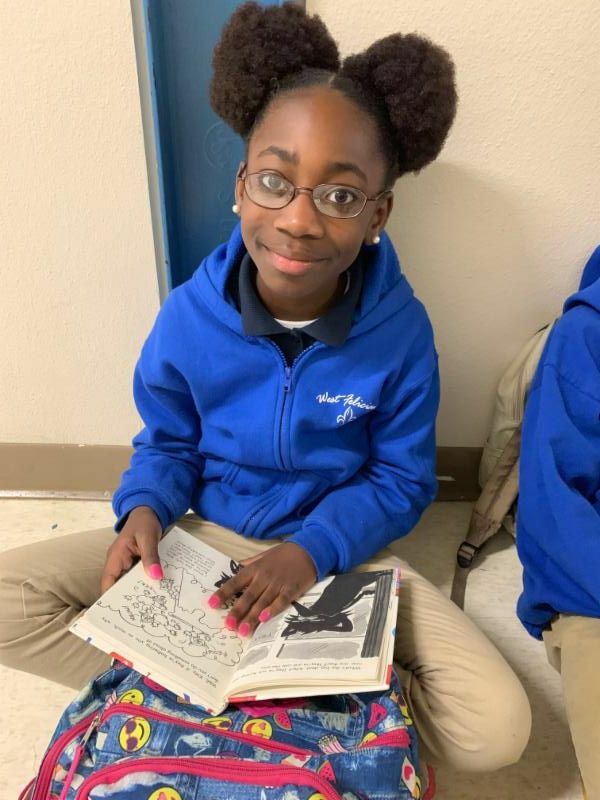 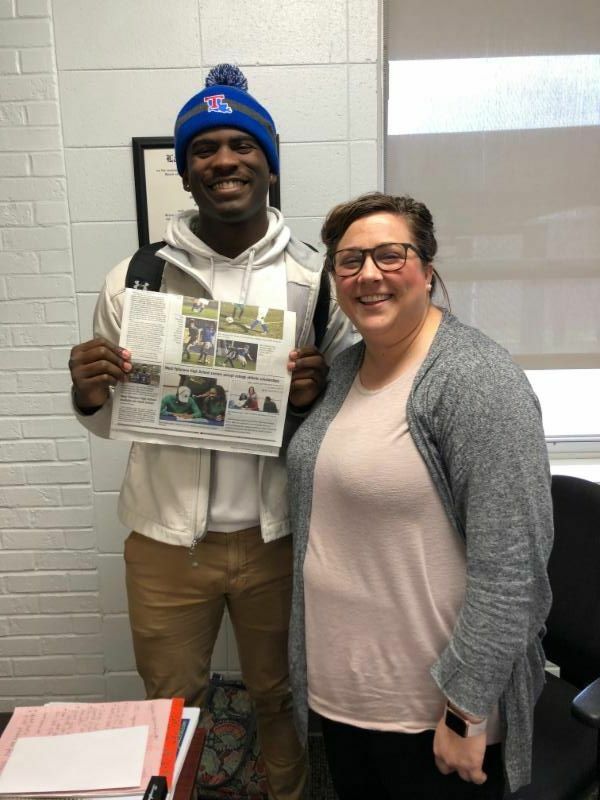 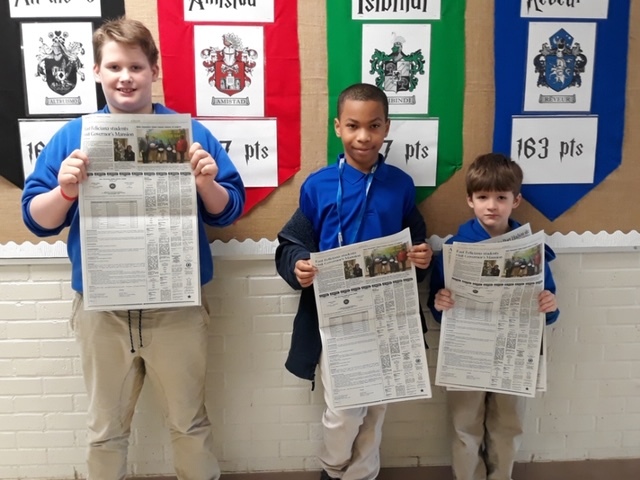 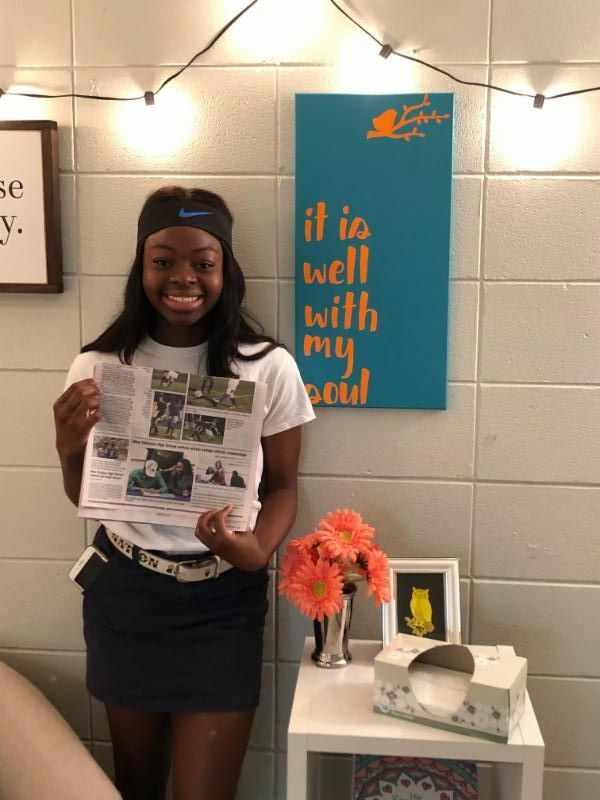 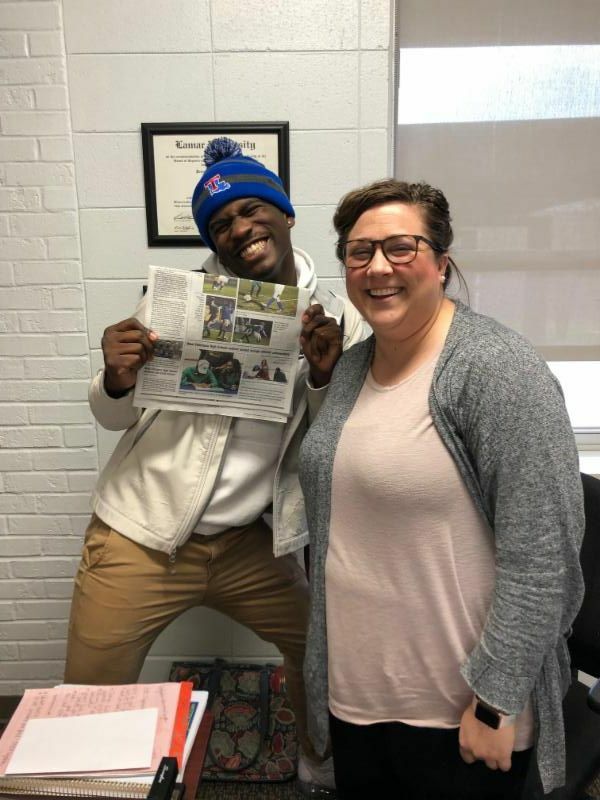 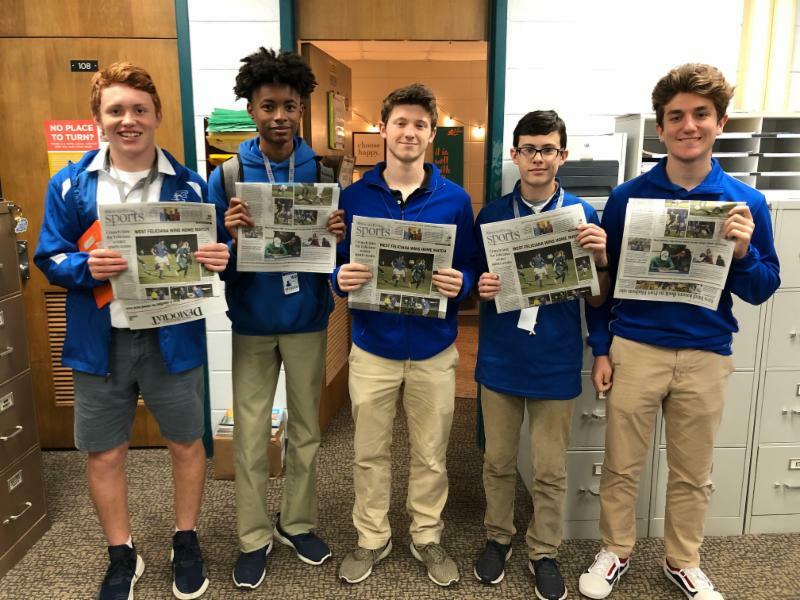 ~ Martin Luther King, Jr.
West Feliciana celebrates our 2019 students of the year! 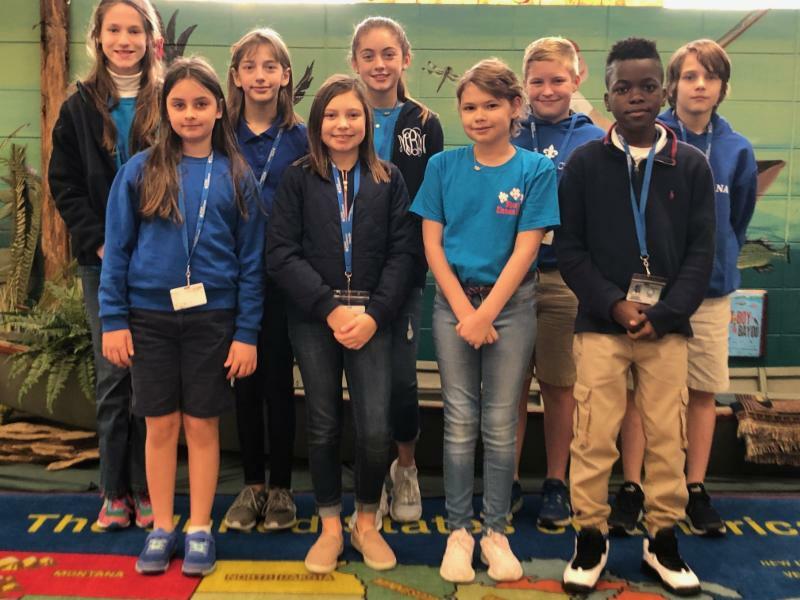 These students represent what is best about our school district and our parish. 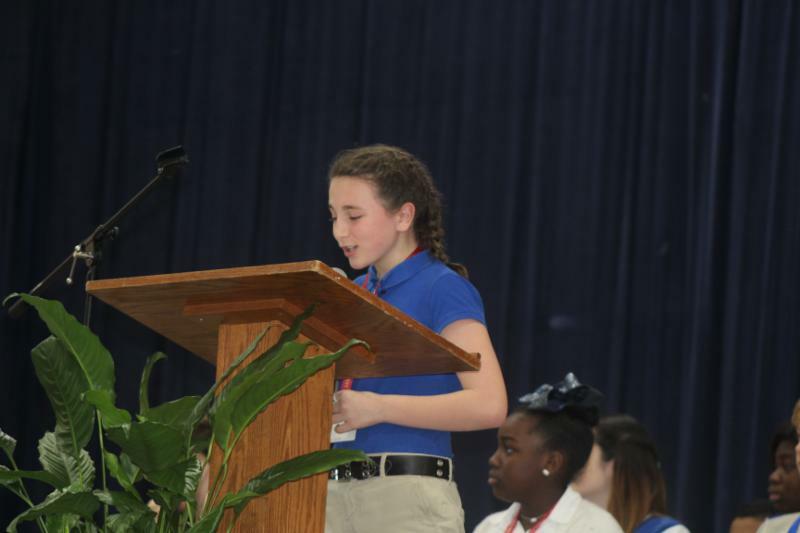 They will now go on and compete at the regional level for student of the year. 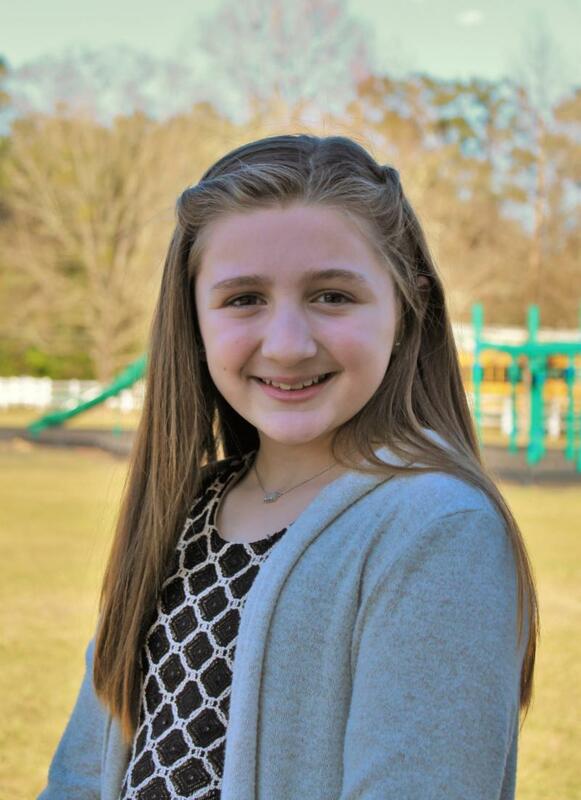 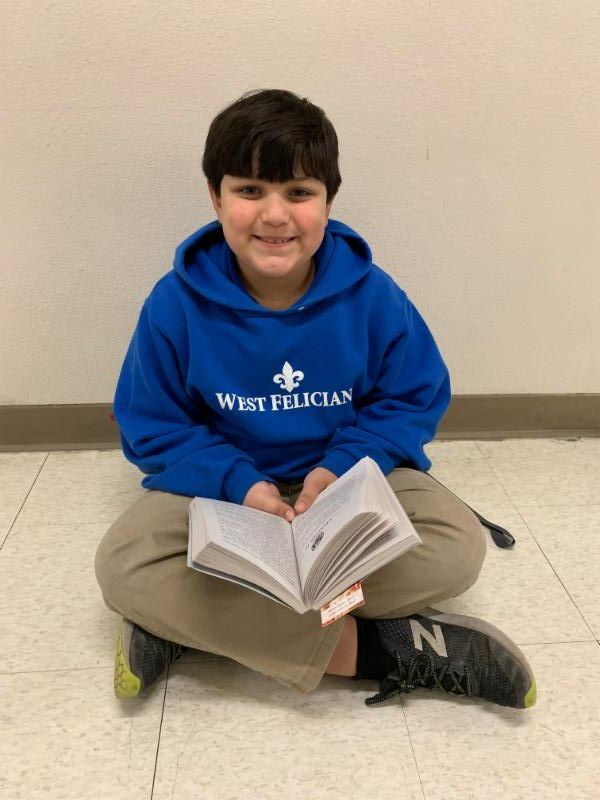 West Feliciana Elementary Student of the Year! 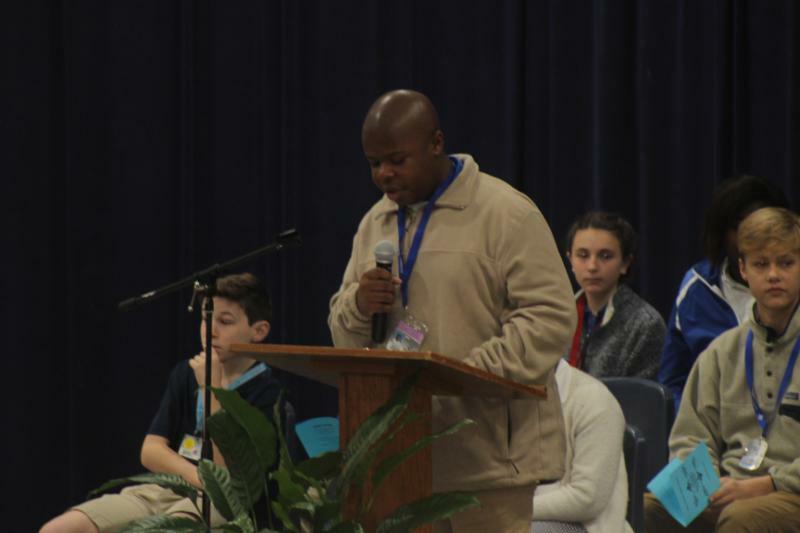 West Feliciana Middle School Student of the Year! 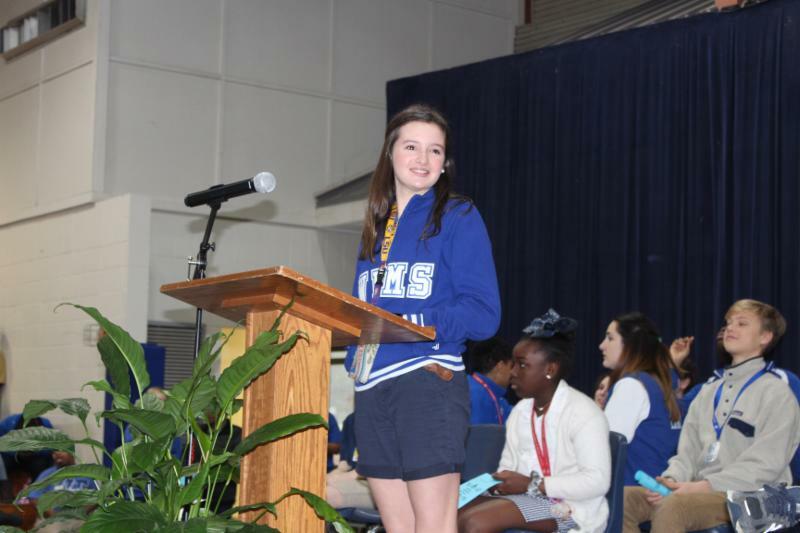 West Feliciana High Student of the Year! 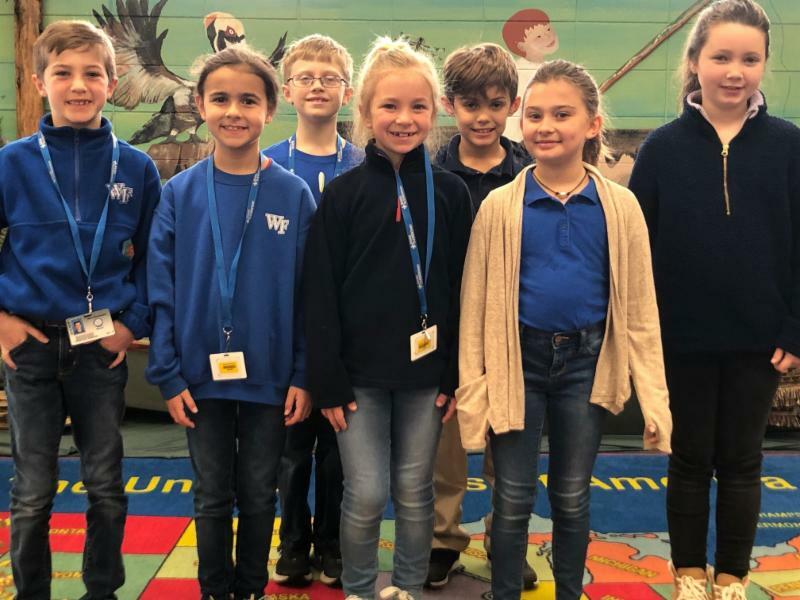 Bains Elementary celebrates their annual Young Authors winners by grade level! 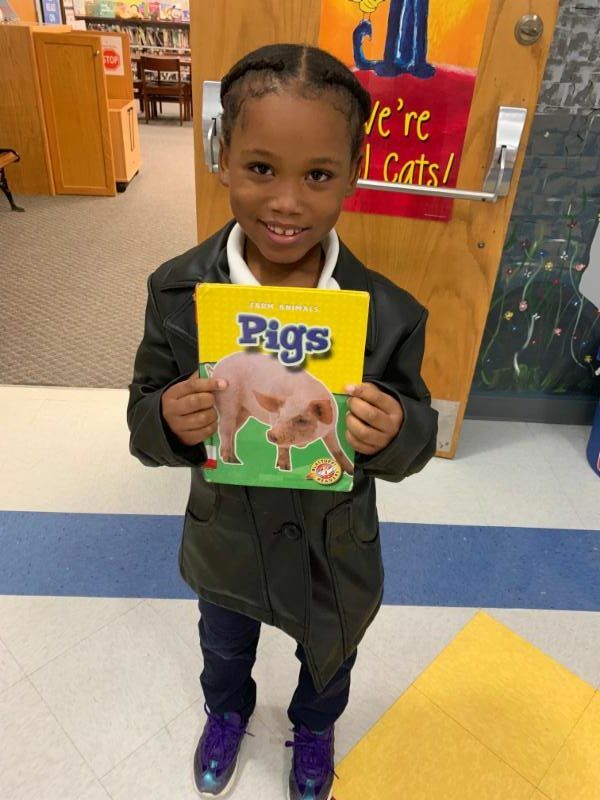 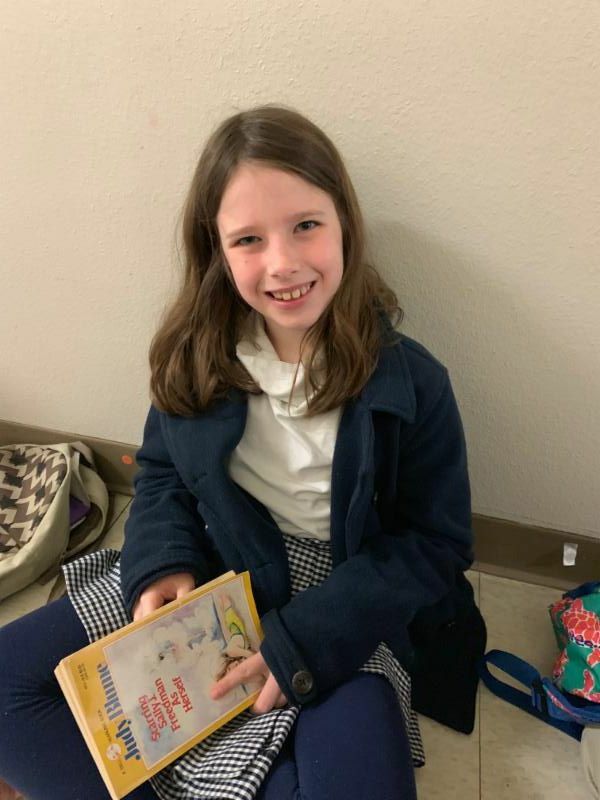 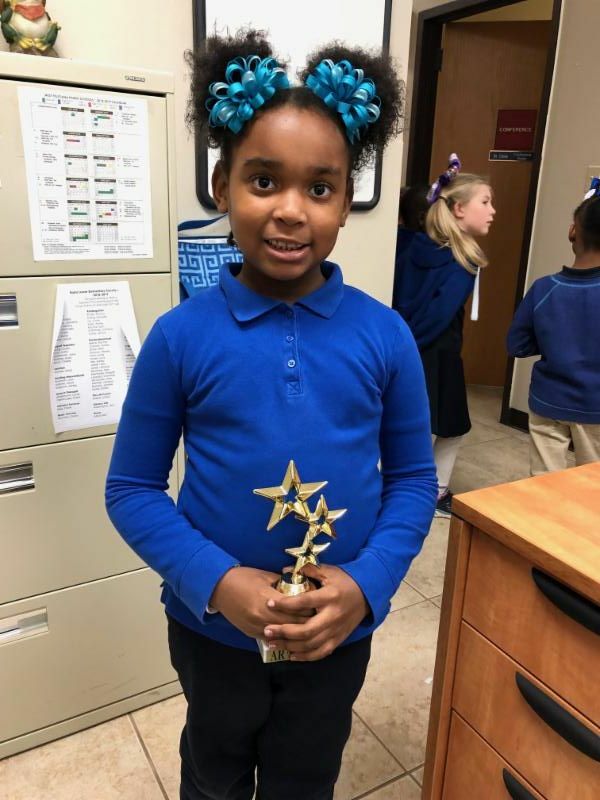 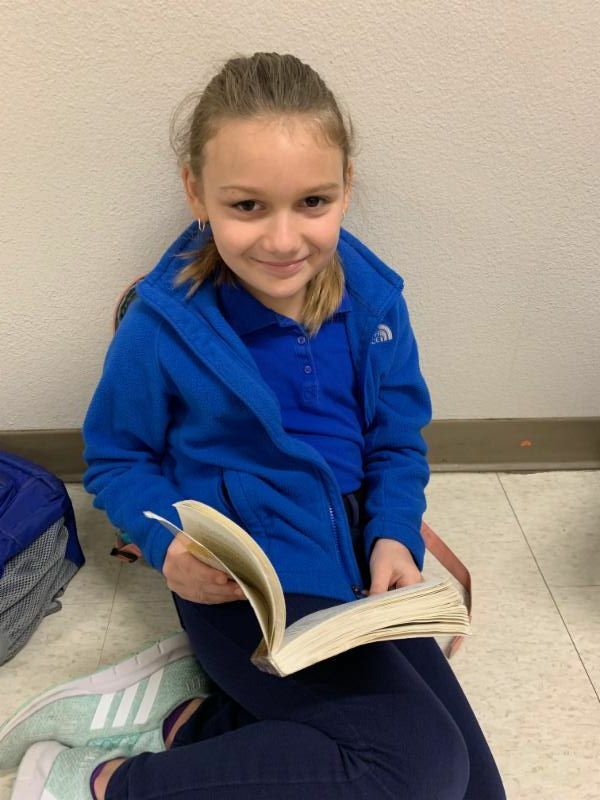 Congratulations go to Bains Lower 1st grade student, Terri'Annah "Lizzie" Franklin, for achieving 100 points in Accelerated Reader! 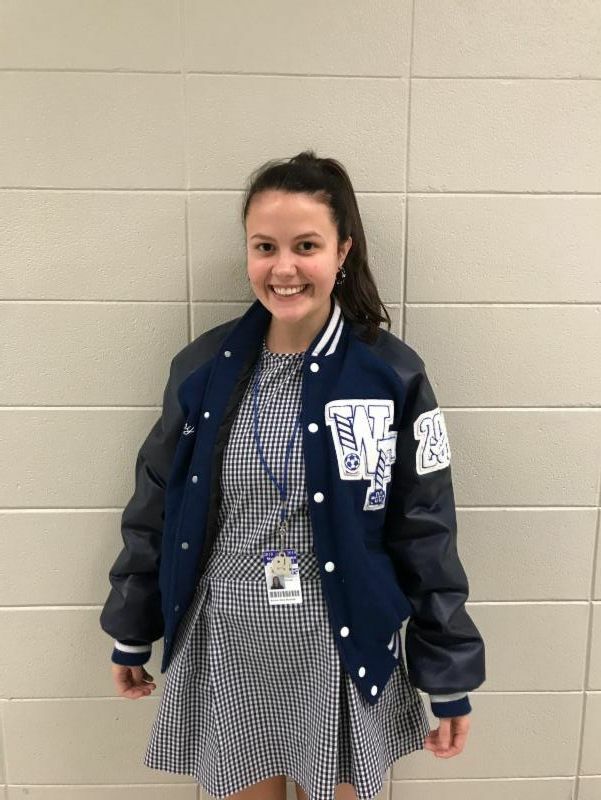 It is a tremendous accomplishment to make the 100 AR Club so Lizzie received a game ball from the WFHS Lady Saints! 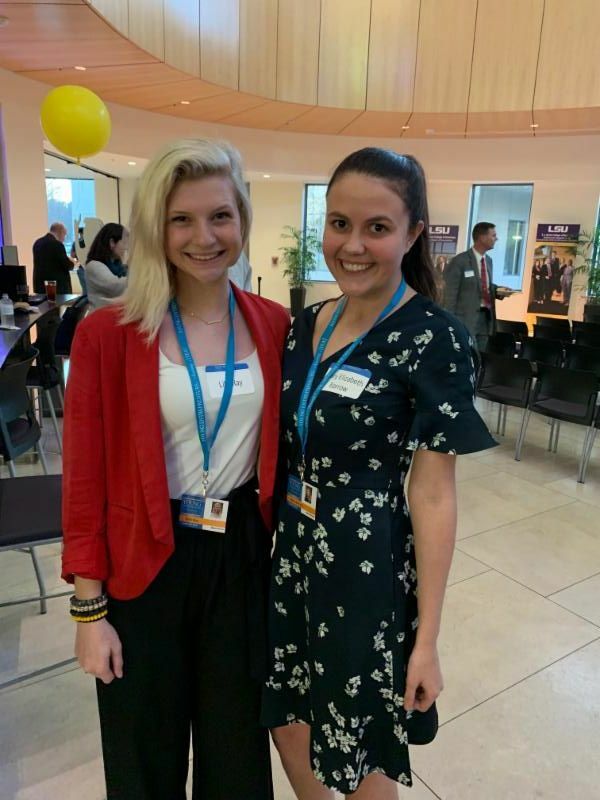 Mary Elizabeth Barrow and Lily Ray attended the Young Entrepreneurs Academy session on Wednesday night at LSU. 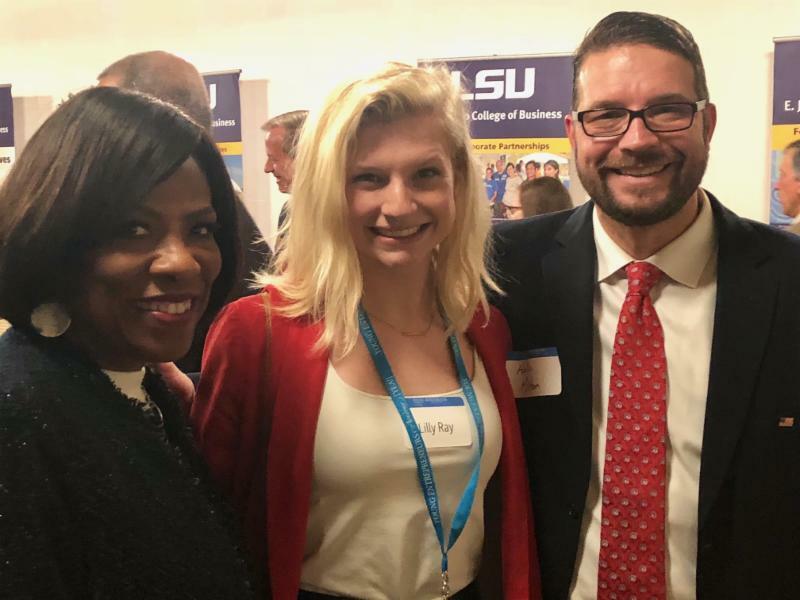 The students in the program were able to listen to personal stories and ask questions of five top CEOs in the Baton Rouge Region. 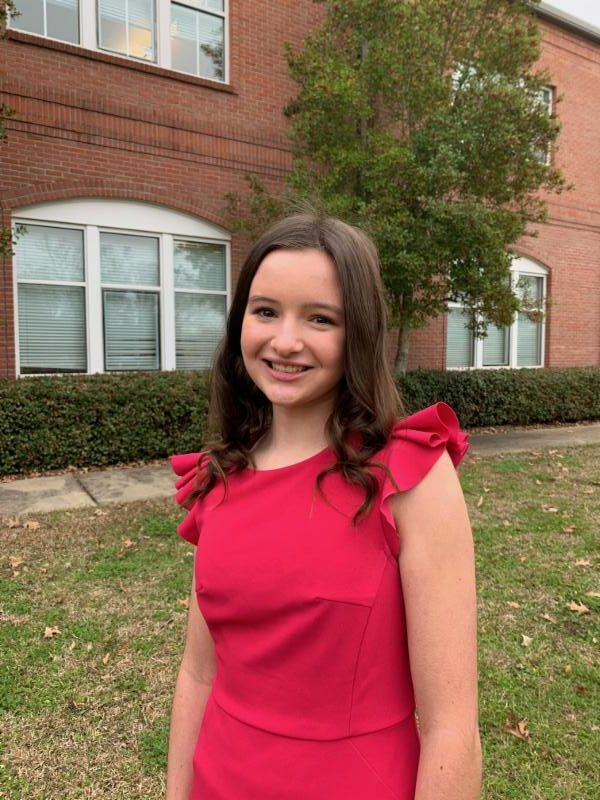 Madison Arbuthnot, WFMS 6th grade, was recognized for her leadership at the WFMS at the 1st semester recognition program. 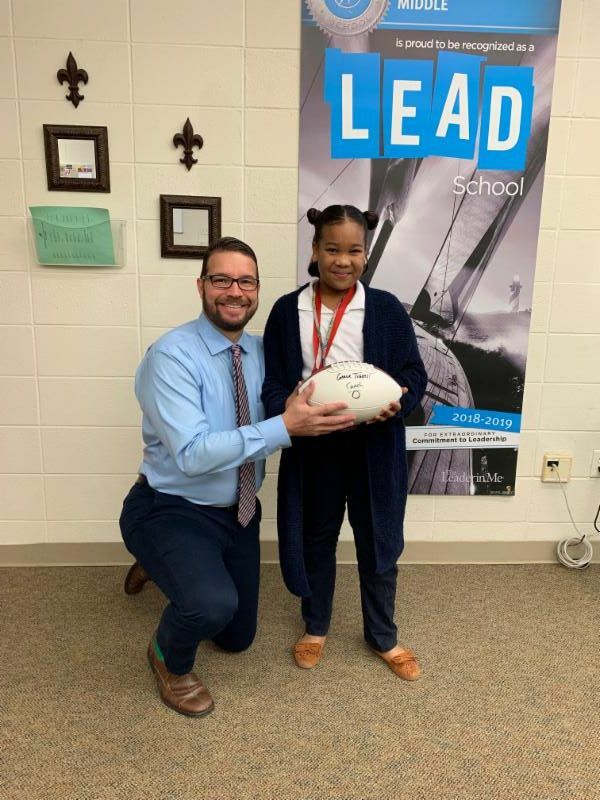 It was my honor to recognize her with an autographed football by LSU Head Coach Ed Orgeron. 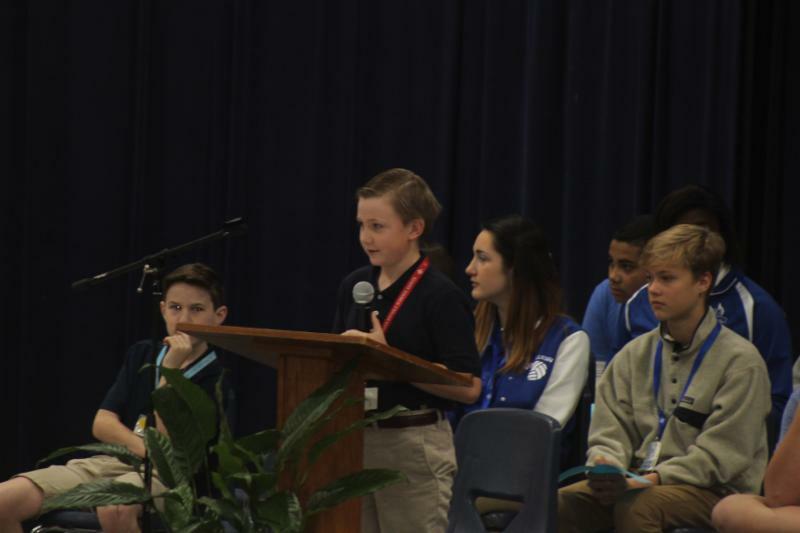 WFMS students apply their leadership skills to lead the 1st semester recognition program. 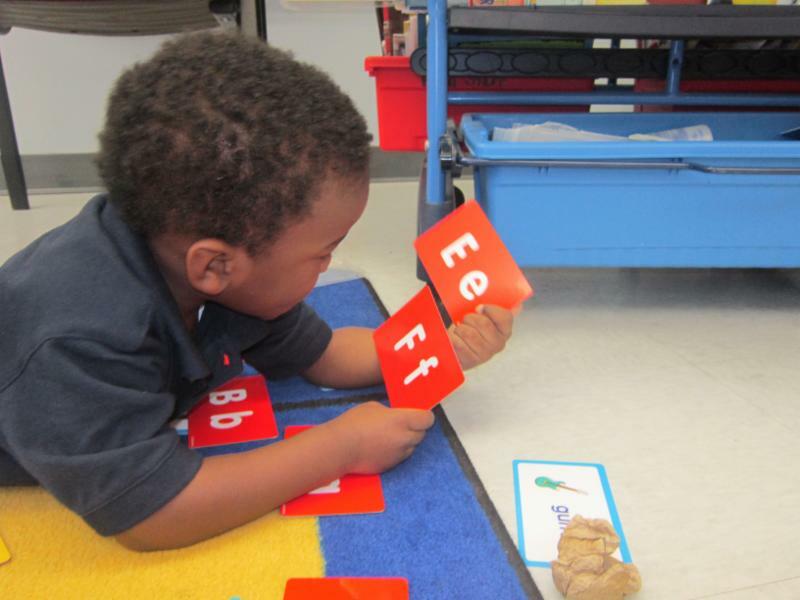 Ivory R., definitely mastered the skills for alphabet knowledge and is ready to soar in Pre-K! 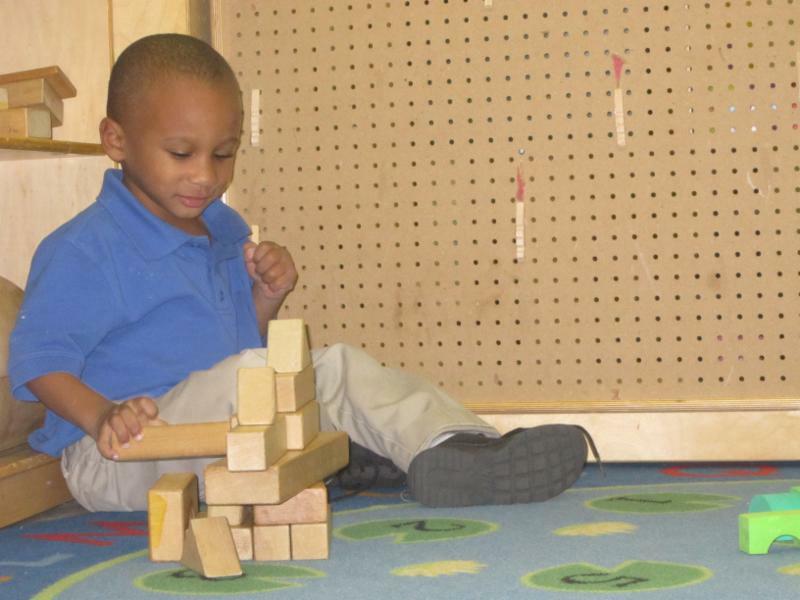 Lamarco W. is learning shapes by creating a building! 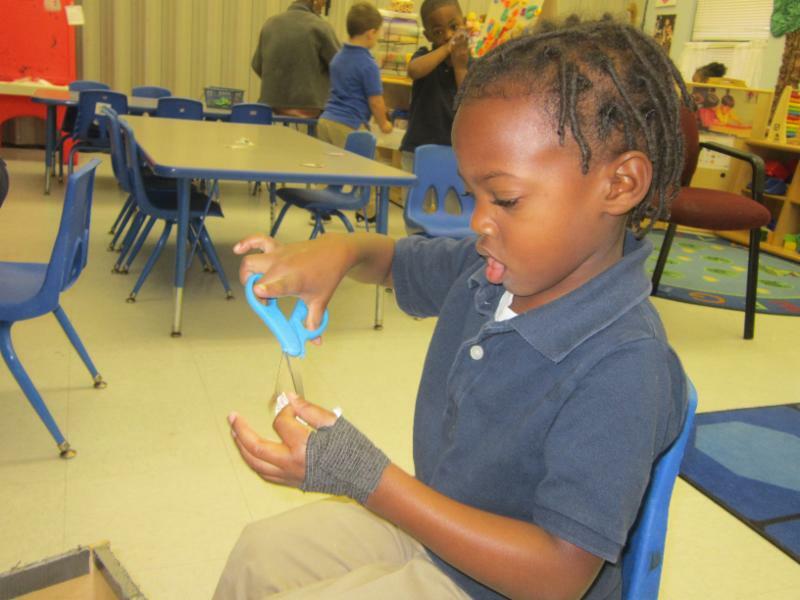 Jakell J. is getting those fine motor skills, fine-tuned for the cutting perfection! 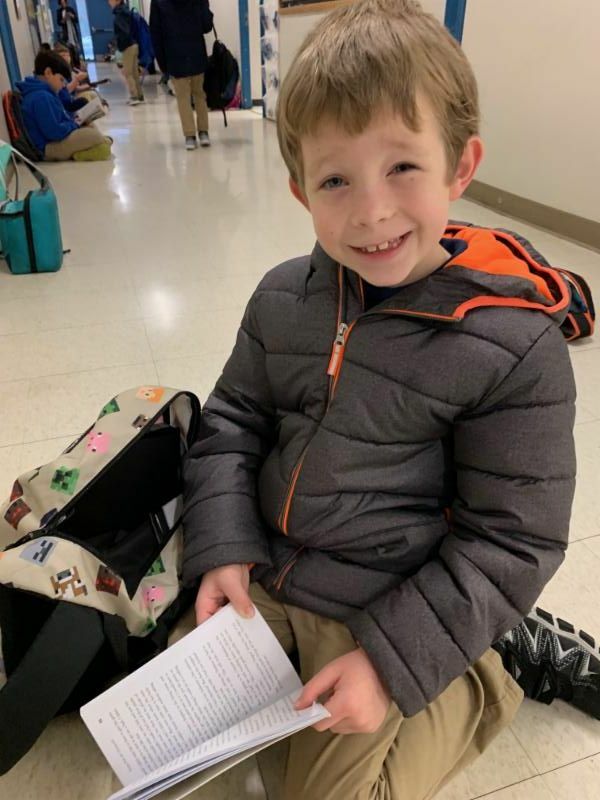 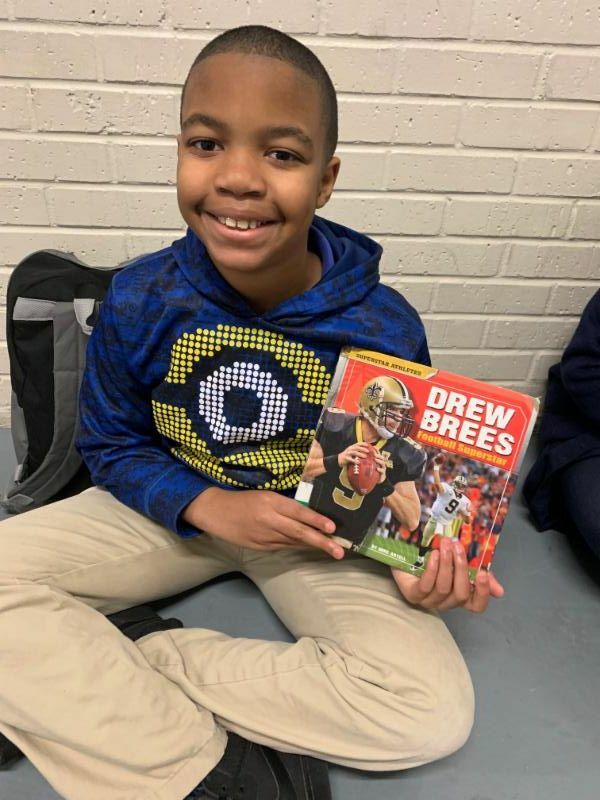 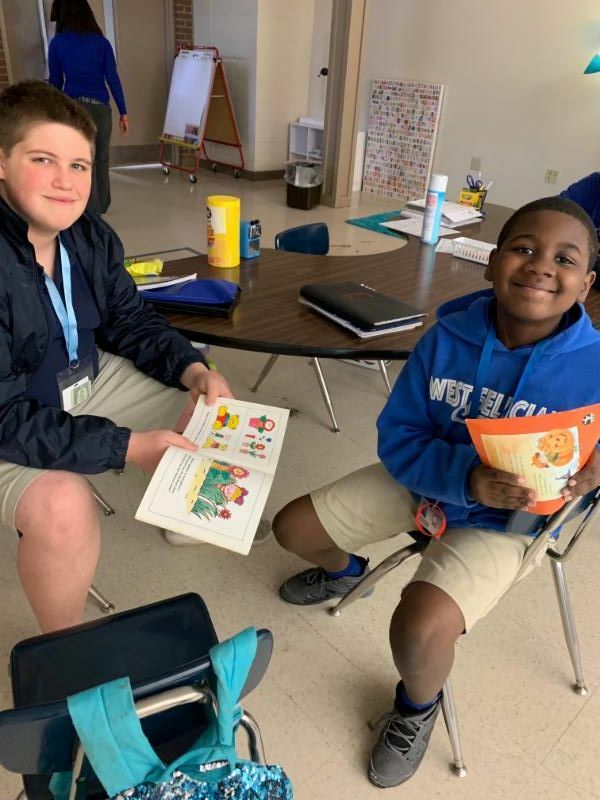 WFMS student William Galloway reads with Caleb Manogin at Bains Elementary as part of a reading project in Ms. Ali McMillan's class. 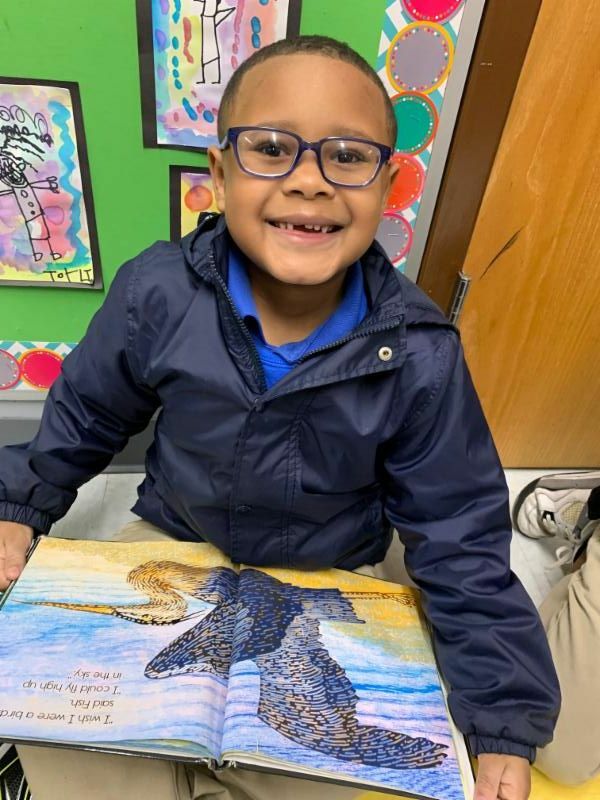 Heaven Sullivan reads with River Reed. 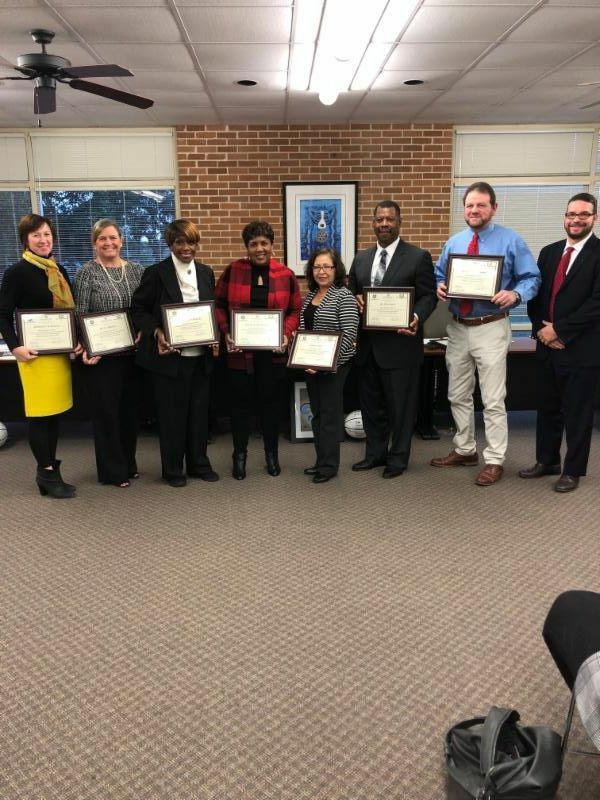 West Feliciana School Board Members were celebrated by each school at the January 15 meeting for their service to our school system and parish! 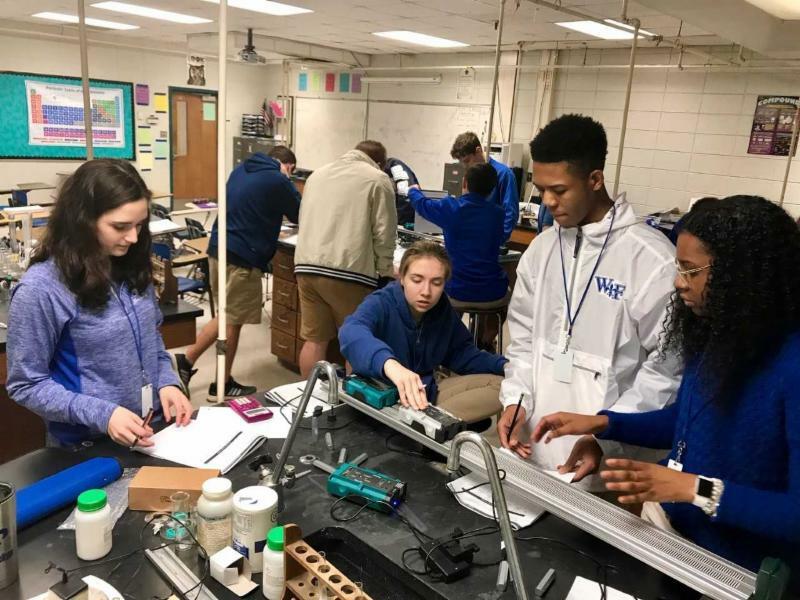 Seniors Reagan Edwards, Landry Higgins, Dylan Weaver, and Bethany McMorris measure momentum in Mr. Justin Davenport's Advanced Placement Physics class. 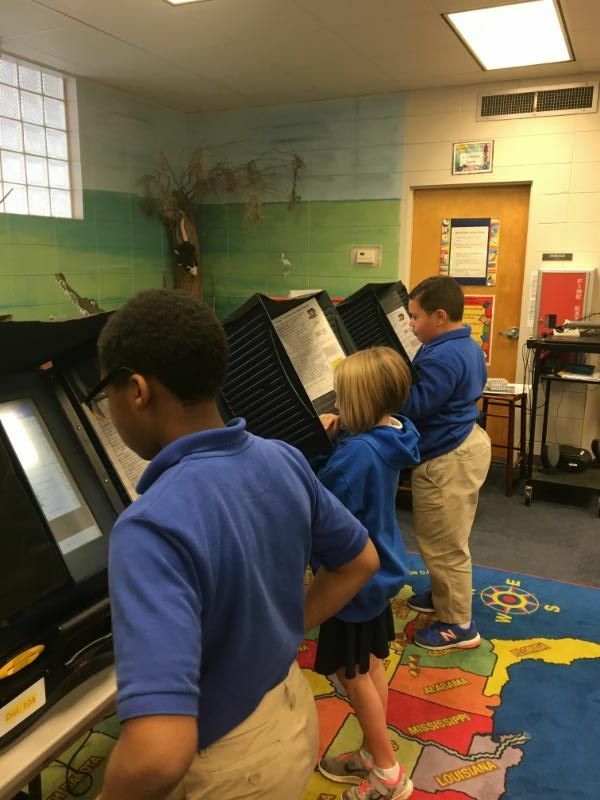 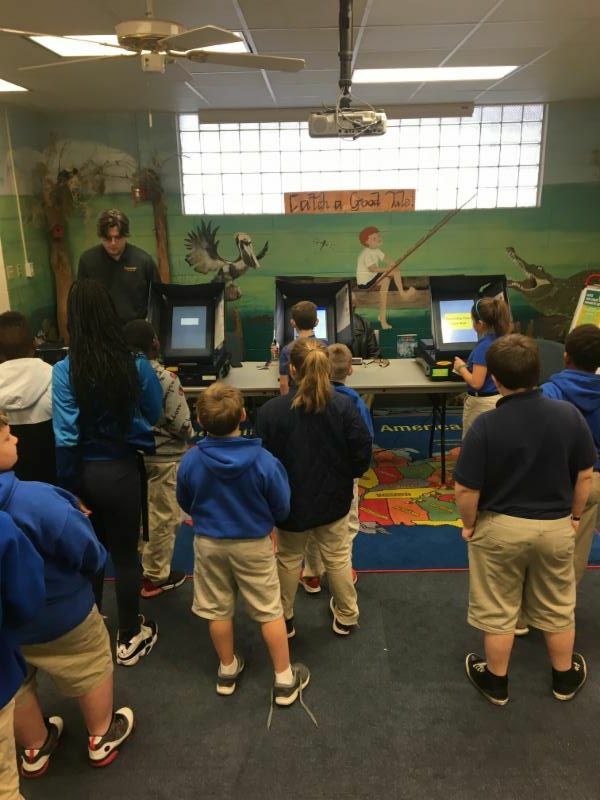 The Louisiana Secretary of State's office brought voting machines to Bains Elementary Library for the students in grades 3-5 to vote in the Louisiana Readers Choice Award 2019. 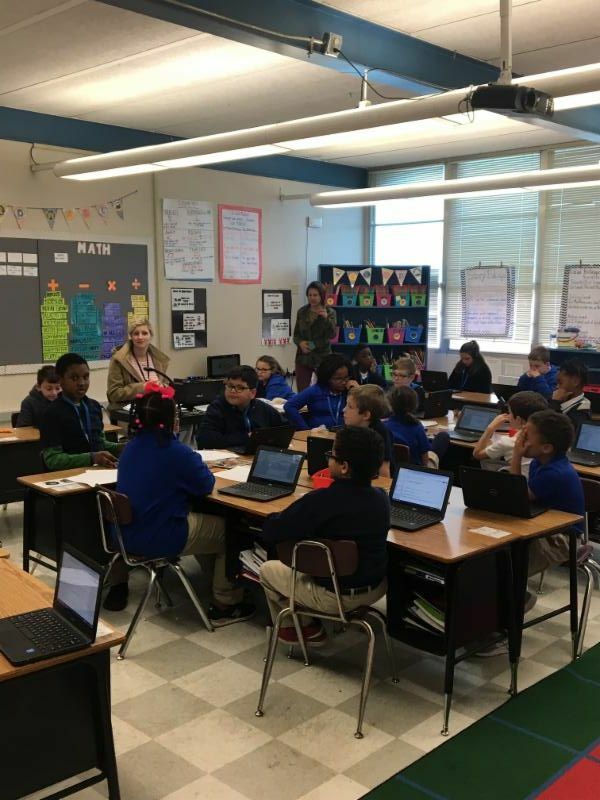 Ms. Brittney Rosenbach's and Ms. Anita Ewing's 3rd graders listening as Jordan Gates shares his ideas on the characters' point of view in a folk tale, "The Tale of Peter Rabbit." 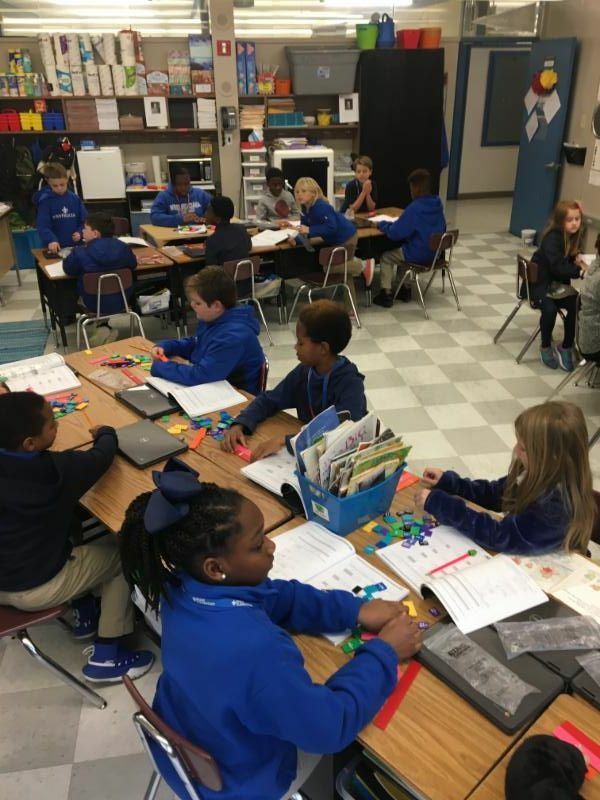 Ms. Kimberly Matthews' 4th graders work together using fraction tiles to solve problems. 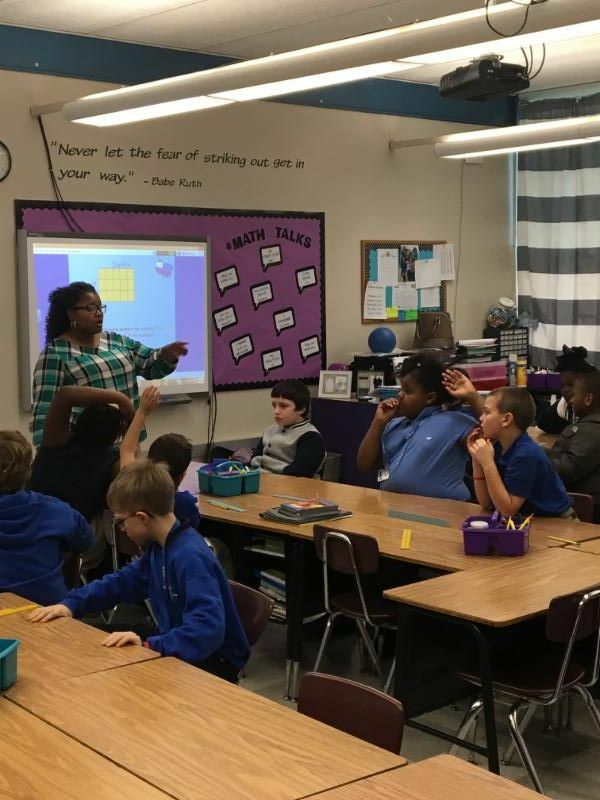 Ms. Nicorrie Gordon's 3rd grade discusses problem solving using area with Kayden Smith, Keianna Johnson and Cole Johnson. 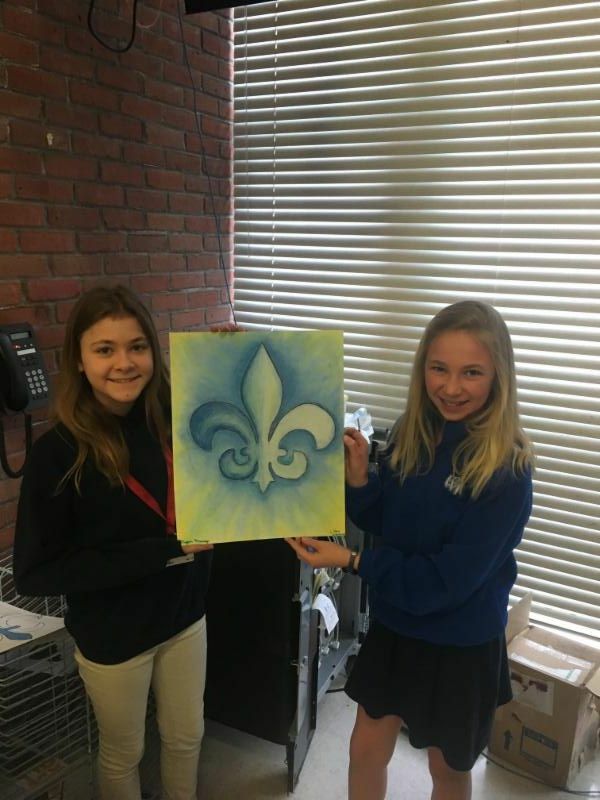 Megan Murray and Libby Levasseur use pastel colors to construct a Fleur-de-Lis in Mr. Kenneth Anio's art class to present to school board members. 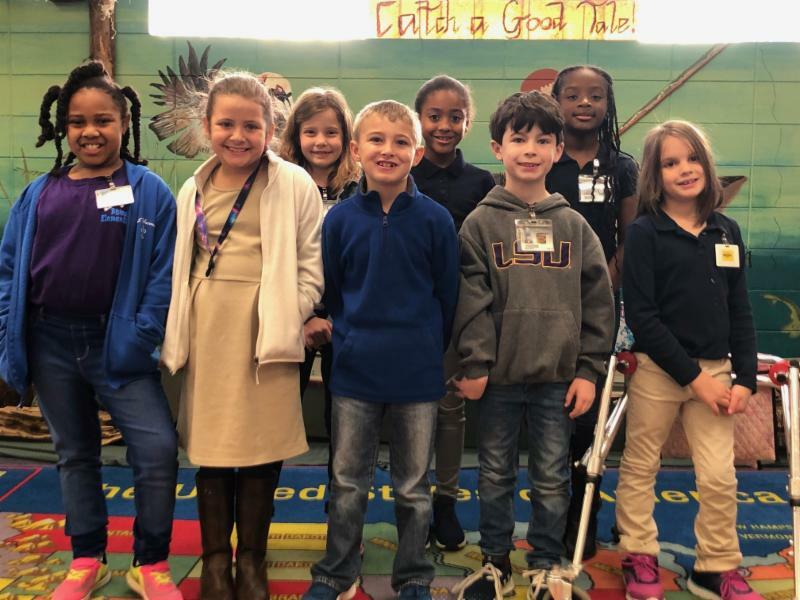 School Board Member Appreciation Month is January. 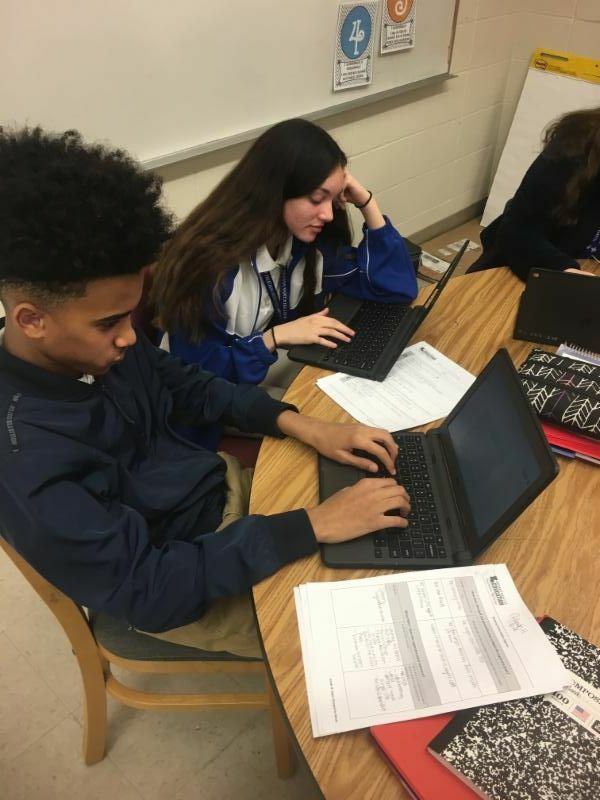 Orlando Harris and McKenzie Kliesch are writing a "Sugar Cane" essay in Mrs. Magalhaes' ELA class. 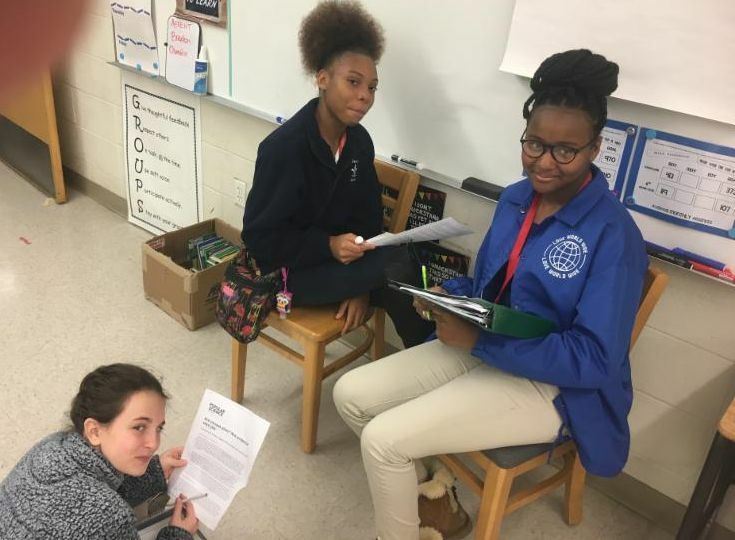 Rachael Gosserand, Jimmik Givens, and Tia Milton are reading an article on viruses, and annotating them using WFMS Annotation Symbols. 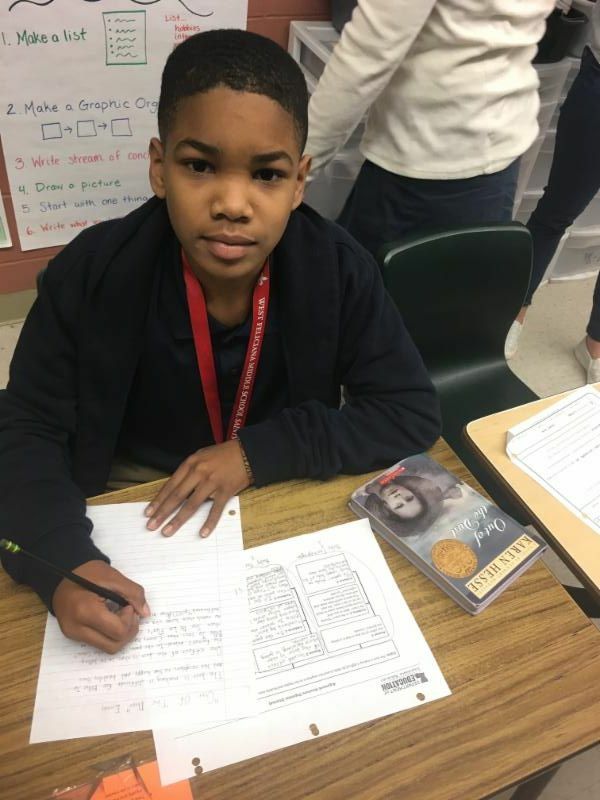 Tre Turner is writing his "Out of the Dust" essay using his graphic organizer as an outline in Mrs. Smith's ELA class. 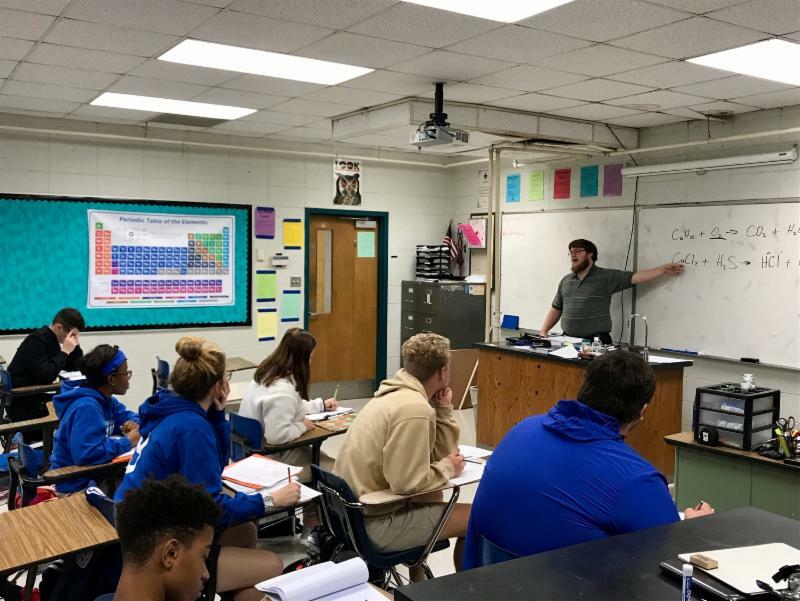 Mr. Justin Davenport demonstrates the characteristics of Copper to his Chemistry students. 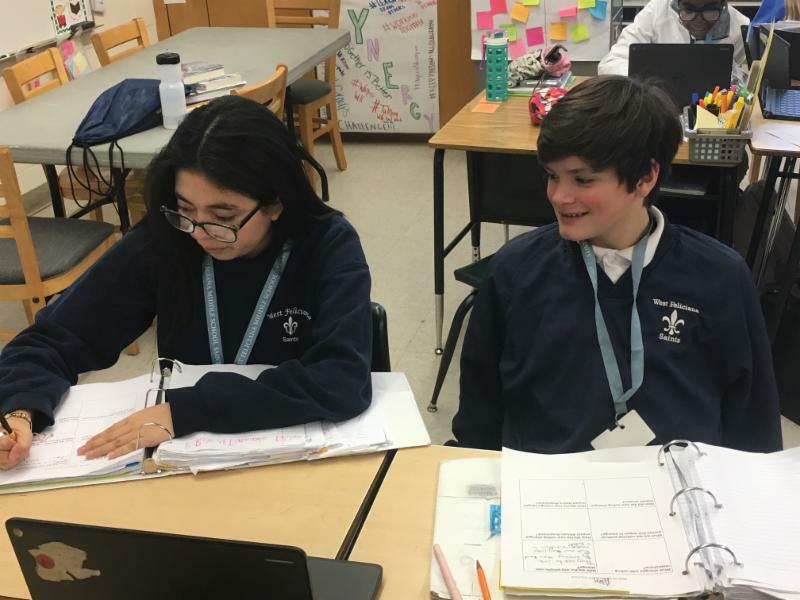 Ms. Eunice Dieguez clarifies the distinction between the singular and plural "you" in her Spanish I course. 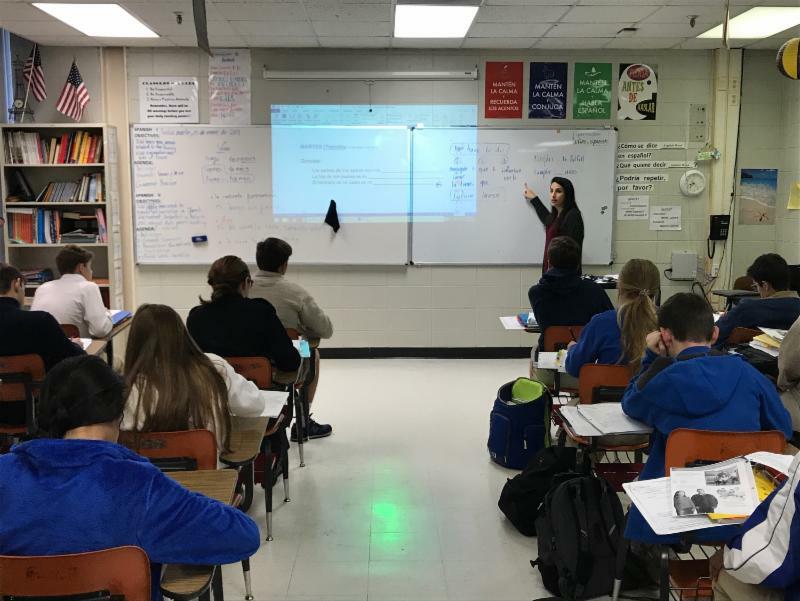 Ms. Emily Flanders assists her Calculus AP students while others work problems on the board independently. 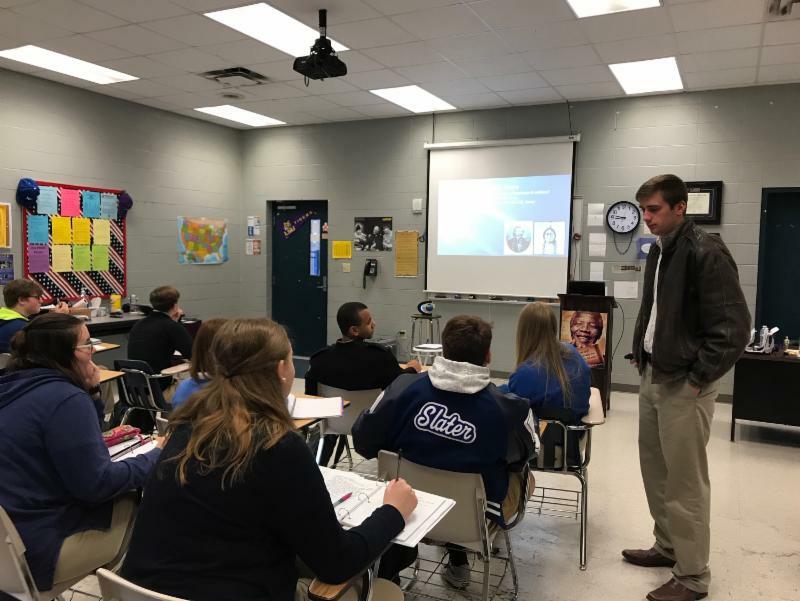 Mr. Max Hawkins explains the strategies of Custer's Last Stand at the Battle of Little Big Horn to his AP US History class. 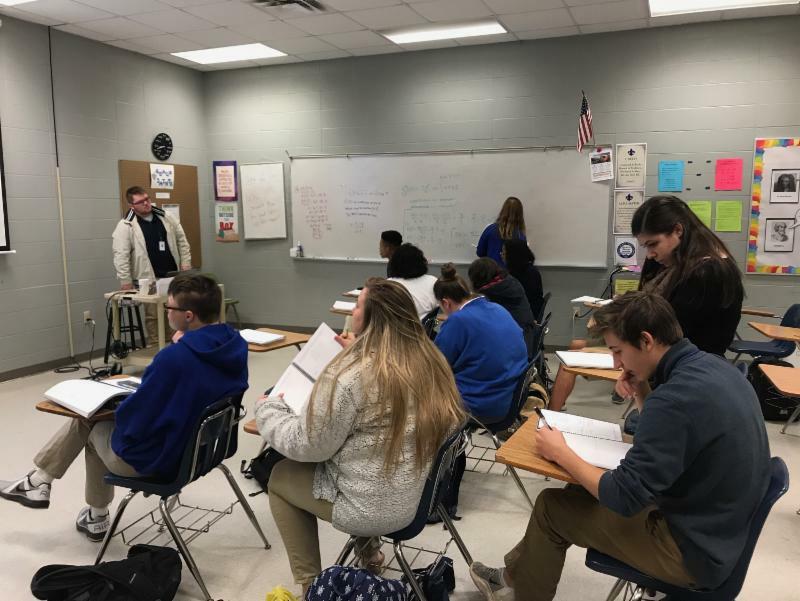 Aden Dornquast and Emily Chaires analyzing primary source documents to understand the "Rise of Democratic Politics" in Ms. Davis' class. 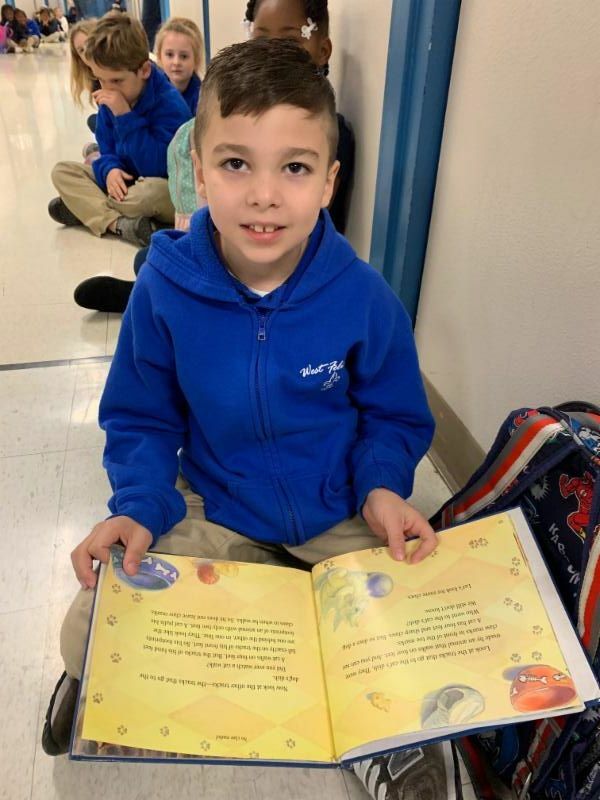 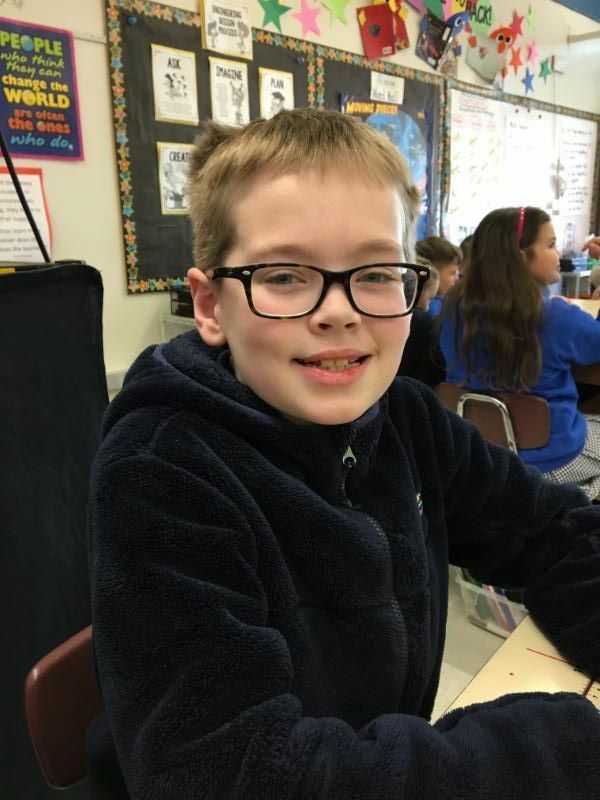 Ezra Self celebrates the 200 point club for Accelerated Reader! 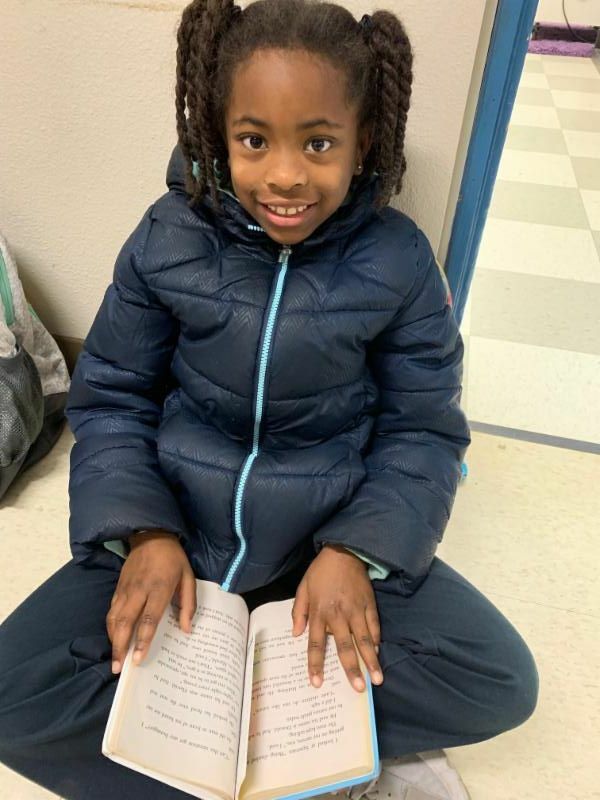 Bains and Bains Lower students stay focused on their reading skills by reading before school. 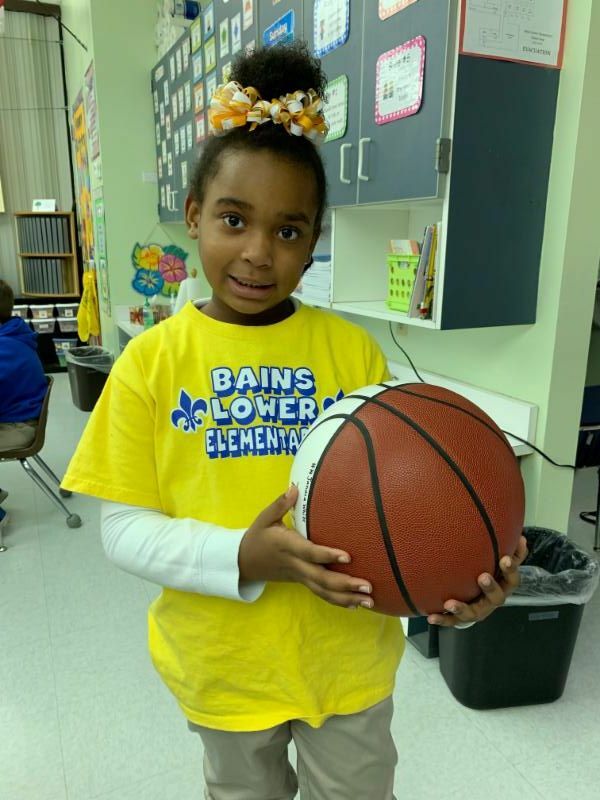 Bains Lower celebrates 100 Days of School! 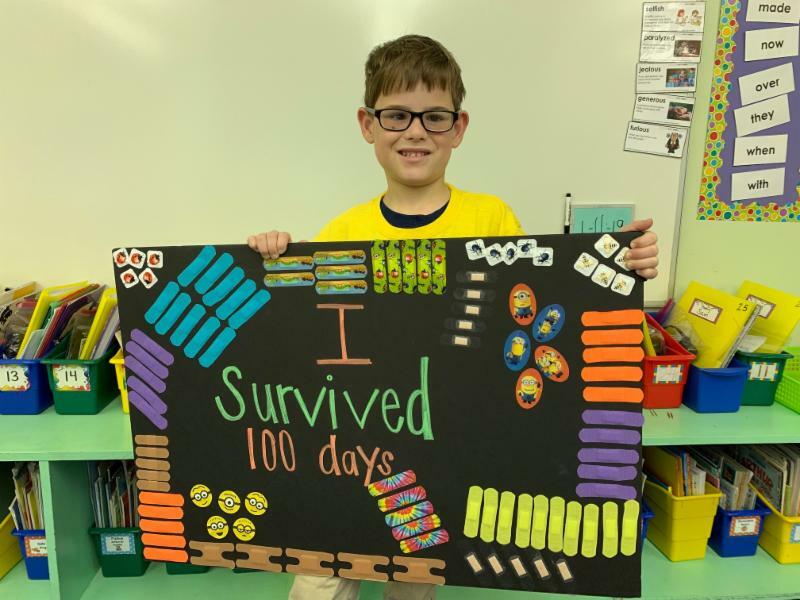 Brayden Gremillion and Layla Vavasseur created really neat posters to count the days. 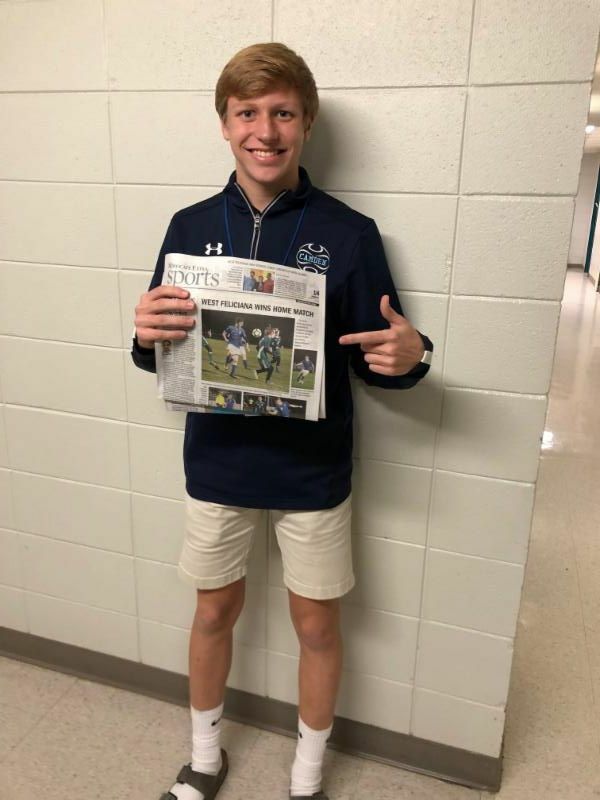 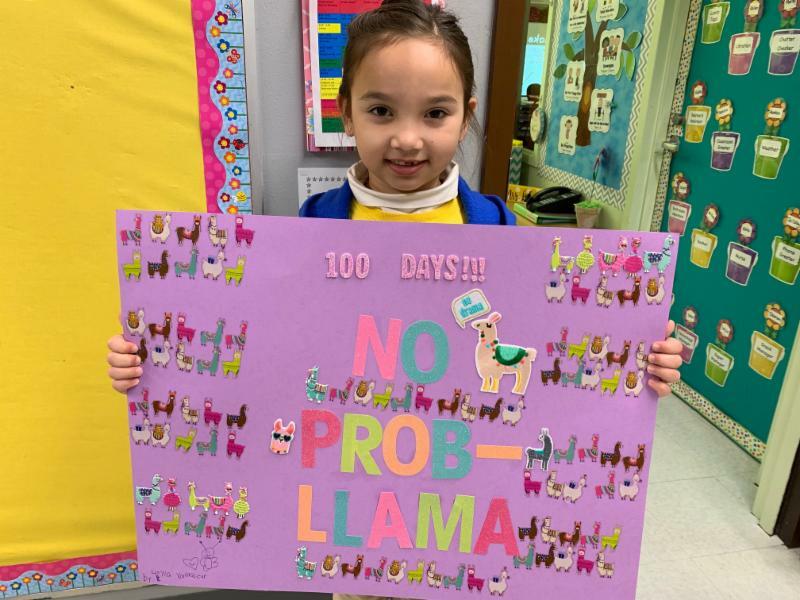 Brayden Gremillion - "100 Days of Bandaids"
Layla Vavasseur "100 Days: No Prob-Llama"
For more information on the bond proposal, please click here.